All club competitions are reaching the business end with several of our teams gearing up for the upcoming finals series. There is now two weeks of home and away matches remaining with sectional finals starting on the 5th of August. The top 4 in each section make the sectional finals, before the two winners of the first week of finals, play winners from the other sections. We currently have 3 teams on top of the ladder in their sections and qualified for finals with another 6 teams sitting on the edge of finals in Tennis Vic pennant. In the WDTA and Bayside competitions, our four teams are all in the hunt for a finals position, with two of the teams at the pointy end of the ladder. All the team’s ladder positions are listed below. Emily Tinker, Tamara Bajagic, Chloe Green, Talia Pati and Sienna Di Natale have had an outstanding pennant season to date winning all 12 matches of the home & away season to remain undefeated. After narrowly missing out on a Grand Final appearance in the same Grade last year, the girls are looking to go one better. With 2 matches remaining in the season, the girls are 40 points clear on top. This promises to be a great season for the girls and the club is hopeful that they can go all the way this season. We look forward to seeing what the girls can do this season and beyond. 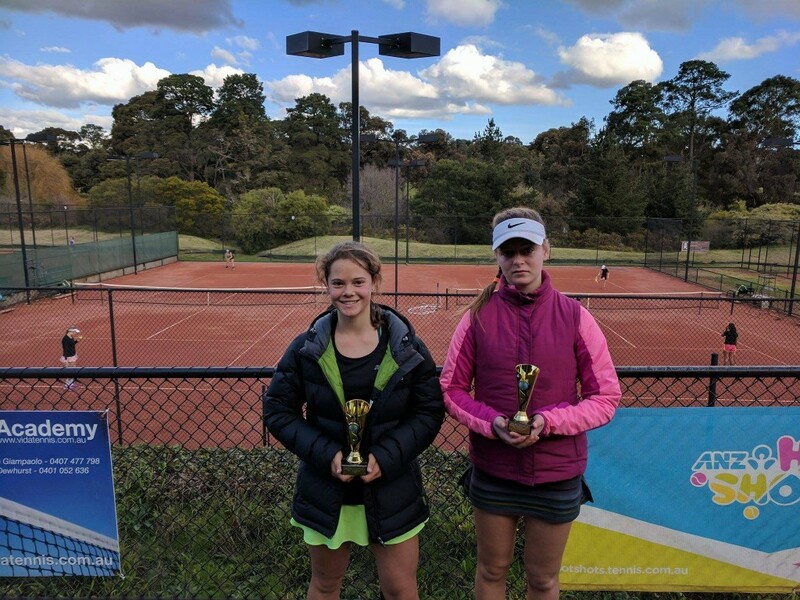 Below Tamara is pictured on the left below after winning the recent MCC Glen Iris Underage Championship Gold JT. See below the current ladder positions.